In 2017, Team Weir listed or sold 300 properties, ranking #7 within the Royal LePage national sales of 18,000 REALTORS®*. These feats were accomplished one satisfied customer at a time. If you are still thinking of hiring anyone else to sell or buy a home, please read on! David has built a highly successful relocation network comprised of 20 top-producing REALTORS® from various locations across Canada. These REALTORS® all work with federal government and military clients and, like Team Weir, are very familiar with House Hunting Trips, Brookfield Global Relocation Services, and the Home Equity Assistance Program. Check out the website at www.dndirp.com to see the variety of locations from which our Buyers come each year. Clearly, Team Weir is very experienced in assisting home buyers who are new to the Quinte area. Please note that this is not a government sponsored site. In addition to the normal internet exposure all REALTORS® offer, we use the services of a professional photographer to create and post a high quality slide show of your home on our website. David also advertises extensively, thereby exposing your home to an even greater number of potential buyers. Selling your home is 'Job 1'. Although David is your primary contact and is ultimately responsible to ensure your sale or purchase is an expeditious and a professional experience, both Buyers and Sellers enjoy the benefits of having an entire Team working on their behalf. There is no additional cost, simply a higher level of client service! Team Weir consists of 2 Brokers, 4 Sales Representatives, an Operations & Marketing Manager, and a Client Care Administrator, all of whom are highly proficient in their fields. Check out the 'Meet the Team' page. The Client Care Administrator takes care of a multitude of details to bring your listing to a close or your purchase to a successful conclusion. This additional level of administrative support allows the other Team members to focus on finding suitable Buyers for your property or finding you the home of your dreams. Team Weir can offer the services of a Sales Representative who is available to work with Francophone clients in their language of choice. We do our utmost to instill confidence and trust in our clients! Équipe Weir peut offrir les services d’un des représentants des ventes bilingue qui est disponible pour travailler avec des clients francophones dans leur langue de choix. Nous faisons de notre mieux pour inspirer la confiance et la confiance en nos clients! As a new client of Team Weir, you will be eligible for a 2 hour complimentary consultation with a professional Stager, as well as professional photography services, to help you prepare your home for sale or to move into once the purchase is final. Be sure to ask us for details. 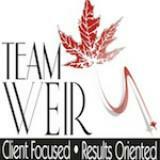 As with all clients of Team Weir, you are invited to participate in a variety of draws throughout the year. You will also receive other Real Estate updates through our newsletters, blogs, and our Team Facebook page. After your transaction is complete, we always welcome your feedback!